Loyal supporters were left feeling shocked and betrayed after Bristol City announced season ticket prices for next year. Like a mirror image of Tory Britain, the most vulnerable fans, including the young and disabled, are the hardest hit, with a sickening price increase of 570% on last season. In addition, adult tickets have risen 16%, senior citizens 17%, under-22’s 25%, and under-19’s 51%. This seems particularly hateful in light of this season’s huge financial gains from TV revenue, cup ties and a record 16,000 season tickets sold. In a further piss take of it’s most loyal fans, BCFC have given fans just 2 weeks to pay up – or they will permanently lose their seats. This is over 5 months before the new season even begins. Many believe BCFC are attempting to ‘nudge’ parents with children into the ‘Family Area’ – way up in the gods of the Lansdown upper tier, thereby freeing up lucrative seats in the areas that provide the best views. If City win promotion to the Premier League, the club can sell those seats at a premium to corporate groups and football tourists. The neighbourhoods of Ashton and Southville are two of the worst affected areas in terms of gentrification in the whole of Bristol. No doubt the club see this as an opportunity to entice a new breed of fan; wealthier and more middle-class, politically right-on, less prone to profanity and happy to sit down and shut up in a sanitised and sterile environment. One fan told us: “I have sat in the same place for 42 years with three generations of my family. For us to sit in the same seats next season, we have to pay an extra £991. The club are effectively saying: move where we tell you or get an economic sanction. Now that they’re on the verge of joining the Premier League, it’s as if they don’t need us anymore. We are not wanted. How can they justify such a steep increase above inflation? This is our reward for the support we’ve given over the years? It feels like the club have put a tax on loyalty”. 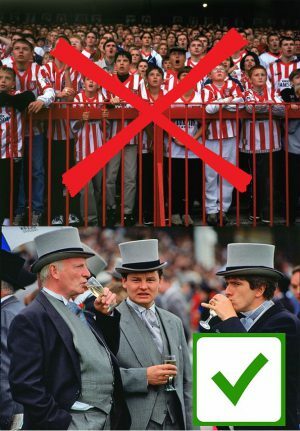 City’s owner Steve Lansdown (non dom financial services shyster) – and his witless son Jon (who just happens to be Vice-Chairman) justified the prices by saying: “The club want to get more families sitting together and feel that is best in the family area”. The board have made the cost of renewing so prohibitive for most, their message is clear: we don’t want you to pay more for your current seat – we want you gone from those sections altogether. This entry was posted in News and tagged 2018 - 19 season, Ashton, Ashton Gate, Bristol City FC, Jon Lansdown, Season ticket, Southville, Steve Lansdown on March 15, 2018 by thebristolblogger.